Saturday Oct. 10th is Mental Health World Day. However, if you happen to be in San Antonio, Texas we’re celebrating this Friday on the 9th. Everyone is invited and we need your support in order to help bring awareness to Mental Health. An awesome and fun balloon release day happens right here in San Antonio, Texas. 1st. 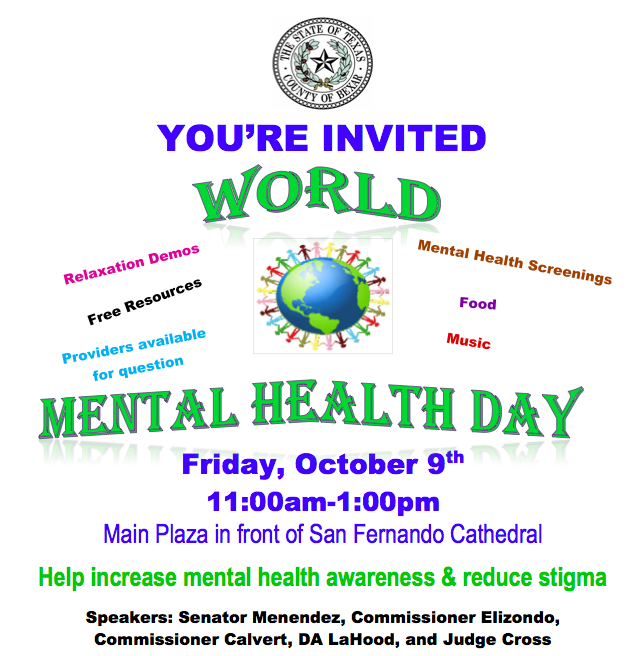 Bexar County elected officials and mental health leaders in San Antonio, Tx Will be acknowledging this day as World Mental Health Day by having a fun and spectacular balloon release, held at the Main Plaza in front of the San Fernando Cathedral. Please join us on Friday and wear a green ribbon on both the 9th and the 10th., as it helps bring more attention to this worldwide campaign. Our mission is to get people to spark up a conversation by feeling comfortable speaking about mental health issues. The color green stands for emotional, behavioral and mental health. The green ribbon symbolizes growth, supports healing and hope, giving the body a positive physiological and psychological effect with tranquility. *If anything it helps start a conversation about this mental health and that alone is success. Wearing the green ribbons really does help as 75% of people feel more comfortable in starting a conversation about mental health, which is up by 71% from last year. Help us get rid of the silence around mental health by wearing the green ribbon. Support really does go a long way. ← Go Ahead, Replace “I” and Insert “We” and see what happens.